The Knicks Win! The Knicks Win! We're not sure everyone understands the ramifications — the awesome ramifications — of Russian billionaire Mikhail Prokhorov potentially buying the New Jersey/Brooklyn Nets. He has agreed to the deal, but needs the approval of 23 of the 30 NBA owners. We desperately want him to get it. Why? 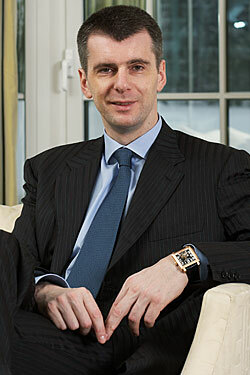 Because Mikhail Prokhorov is unlike any other billionaire, any sports owner, any human. You really need to know him better. Thus, our weekly series here on The Sports Section: Mikhail Prokhorov Theater, in which we retell grand old anecdotes about — and we want to be careful not to overstate this — the world's most amazing man. This week: the Truffle Carpaccio. No, the expensive stuff was the booze. The lunch was topped off with a $5,000 bottle of vintage 1998 Chateau Petrus and two bottles of 2002 Montrachet Latour for $3,600. That's not just a lot for lunch ... that's a lot for a Russian! Prokhorov's parties in the French Alps, the ones that got him in so much trouble back in 2007, were famed for their extravagant amounts of alcohol. In fact, Prokhorov was once called the French Santa Claus of Booze. "He is our Gatsby magnifique — to us he was like Santa Claus," said Julian the jeweller, with tears welling in her eyes. "We are all terribly, terribly sorry about his departure. In five minutes it has been ruined — the Russians have gone and we are worried they may never come back again." Prokhorov came back. He always does. When he takes over the Nets, you can fully expect a vodka bar, maybe even a vodka fountain. He is Santa Claus.